Today i will discuss how to configure / Register LS Cable ONT in LsCable OLT. Here i use LST20016 OLT. At first login your OLT & follow bellow step. 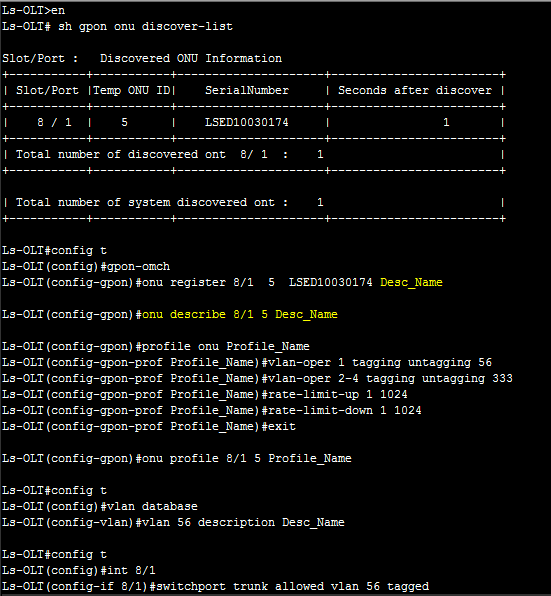 Step-1: Find ONT serial in your discovery list. Step-2: If find your ONT discover list then need to register it. Step-3: Now add description of that ONT. Step-4: Now need to create a profile with VLAN & assign Bandwidth. Step-5: Now apply profile on that PON port. Step-6: Publish vlan at Vlan database. Step-7: Declare vlan at PON Interface. Step-8: Declare vlan at OLT Upstream Interface. Bellow are the example of configuring Lscable ONT. Now your ONT configuration is completed………………. Then no need to configure bellow step again.